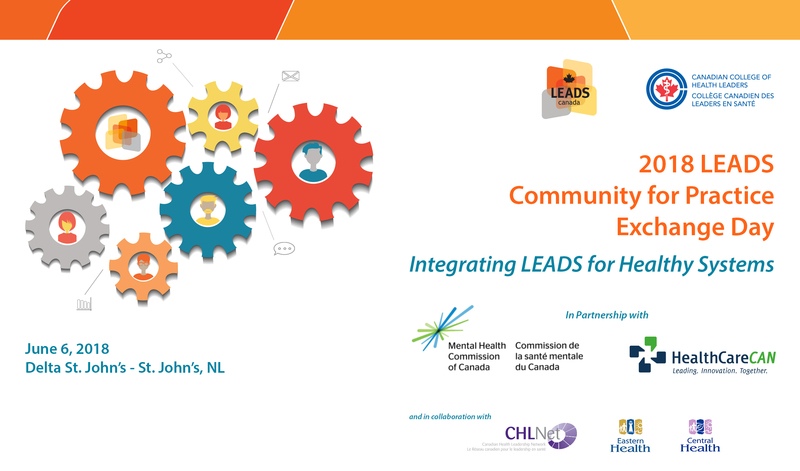 The 2018 LEADS Community for Practice Exchange Day will take place on June 6 following the National Health Leadership Conference, June 4 -5, 2018, in one of the most colourful Oceanside destinations in the world, St. John’s, Newfoundland. The focus this year will be on integrating LEADS for healthy systems change at the organizational, regional and provincial level. We will take a look at integrating LEADS from each of these perspectives. In addition, special attention this year will also be on the leadership aspect of integrating the Mental Health Commission of Canada’s National Standard for Psychological Health and Safety in the Workplace and creating a mentally healthy workplace using a LEADS lens. The event is in partnership with the By Health, for Health Collaborative , a collaboration between HealthCare CAN (HCC) and the Mental Health Commission of Canada (MHCC). Stay tuned for the list of speakers who will share tools and practices of integrating LEADS at the provincial and local levels, as well as across settings and professions. The LEADS Exchange Day is offering a number of sponsorship opportunities. Each sponsorship level provides a significant list of benefits and opportunities. Flexibility is available at each level and we would be pleased to tailor a benefit package for you. Download our Sponsorship prospectus and application form here!